There have been a few PF bloggers that recently wrote about the cost as well as the pros and cons of eating out or bringing your lunch to work everyday. I am a huge proponent of brining your lunch to work. I probably buy my lunch once or twice a month. I think it's important not to beat yourself up over it, but is is important to know where your monies going. If I grabbed coffee and a breakfast sandwhich at TH's everymorning that would run me about $3/day. If I also got lunch each day it would average about $10/day. If there are twenty work days in a month = it will cost (at a minimum) $260/month to eat out. My entire grocery budget is $200/month - so this doesn't work for me. That $200/month includes breakfast, lunch & dinner: Monday-Sunday. That is plenty enough money (for me) to eat in a month). That said, I do budget $100/month for restaurants. If I choose to eat out a few times that fine, or if I want to go out for a fancy dinner, that's planned for too. That's the point - it's planning. If you want to spend $260/month (or more) on eating your lunch out - do it. But plan for it! Know how much money you are spending and know that something else will likely suffer because of it. I recently posted about a few unexpected expendatures. Everything has been now been posted to Visa, so my new balance owing is $1633. I was having a pretty large case of buyers remorse, but in looking at the numbers I have paid off 49.3% of my credit card debt since starting this blog. I'm happy with that, and one patio set (which was $180) isn't going to ruin me. Nor will $300 or so worth of car repairs. In between June 26th and July 1st I will pay off any interest that has accrued and been added to the total owing as well as any automatic payments that have accrued (a video game I play is billed monthly to my credit card as is my cell phone bill). July 1st, 2009 - $0 balance = credit card debt free = consumer debt free! At that time I will review my student loan payments and my savings goals and make adjustments to my budget. I read Gail Vaz Oxlade's Blog and in the 'Have your say' section. Someone replied to someone elses' question regarding combineing your finances once you're married. It was a great post! so full of Love! This is for Danny Jellis to answer his question.It is funny that you should ask what we married folk think because I just finished having a discussion on this very subject with some young friends of ours. The young couple asked otherwise I would never have given them my opinion. Yeah right. My husband tried to warn them. He said to the boy “Quick, lie down and play dead” but the girl really wanted to know. I don’t know what the other married ones think but I know what I think. We have been married for 32 years, 4 months and 22 days – but who’s counting? Before that we lived together for 3 years and that was in a time when living together and getting pregnant out of wedlock was not widely accepted. We are still together because both of us can still hardly wait to share our day with the other one. If either of us felt differently we would not still be together. But that would be okay too. In our vows we changed ‘til death doth us part to ‘til love doth us part. We were lucky in that we never happened to fall out of love with each other at the same time. I was never one of those girlie girls who wanted to get married but from the first moment I saw my husband I knew that he was the one. He proposed to me 10 minutes into our first date and every week for the next 3½ years until I finally broke down and gave in. We never needed that marriage certificate (other than to get a mortgage) because we both knew it was for keeps. We knew this because we loved each other, liked each other, could make each other laugh until we peed and we wanted to share everything. I wanted to take care of him and he wanted to take care of me. We have grown and changed over the years but I would still give him a kidney and he would still jump in front of a stampeding cow in order to push me out of harms way. Hopefully next time it won’t be into a ditch full of water and cow p***. If you don’t want to share everything what is the point? You should just be ships that pass in the bar or friends with benefits. With every day that passes we share a past. From dawn to dusk even if we aren’t together we share the present and every night we go to sleep knowing that we are going to share tomorrow. God willing and if the creek don’t rise. When you share your time, your thoughts, your dreams, your bodies, your DNA, your wacked out crazy family dinners, a dozen glasses of wine, a box of cookies and only one sink in the bathroom sharing the money is nothing. Just part of normal. And who earns what, spends what, has what and gets what is unimportant because you are one and working towards the goal of taking care of your family and making each other happy. In our case the first two and a half decades we were also working hard towards the goal of acquiring debt but the last years we have been working towards getting rid of it. And that has been one of the best ways of making each other happy. From the first day we started living together we have always combined all of OUR income because it is OUR life. I have never earned as much money as he has but my work at home and outside is every bit as valuable as his even though it didn’t have the same dollar value. Money makes the world go around but it doesn’t keep you warm at night and take the kids to the park so you can have a nap. When he was unemployed or back in school I was the bread winner but I was earning OUR money. We have always paid OUR bills with OUR money. And yet we have also always had our own money too– we call it our allowance – for which we are accountable to no one. Makes us independent while still staying joined at the bank account. To us this just makes sense and makes OUR life so simple. Excellent news. Well, perhaps, moderate news at least. Parts for the car are going to be about $100 less then we expected for the parts that we knew we would have to buy. Unfortunatly I also had a gasket, and a ball barring that need to be replaced. The gasket was about $40 and the ball baring will be about the same. J took my car to work today so hopefully that get's squared away tonight and I can have my car back. I've been driving J's truck the last few days. S, the mechanic, wants $100 for his time which is a far cry less then what I would pay if I had taken it to an actual shop instead of my J's shop (sounds complicated, but only if you don't know who I am and what J does). S, was previously a Mazda mechanic for 15 years and said that if I treat the car right and get regular maintenance I should be able to get 500,000km on that car. I'm pushing 180,000km now - so it has a long life ahead of it. Looking at it that way, it's worth the $300-500 we are putting into it now. I feel pretty good about everying. I hope I will be able to save a few hundred dollars for the next time this comes up. I'm going to look at my savings accounts and goals and make sure I've got a plan to take care of this beater of mine. Even great plans with good intentions can run into problems. I have recently set up these finanicial plans and goals to plan for the future and to pay for the now. Unfortunatly some future has come up before I had the $$ saved for the future. I blogged a few days ago about a fleeting desire to have a new car. Well, my current car a '97 Mazda is now in the shop. The parts will cost just over $300. Most of the labour will be free because my Partner, J, is working on it tonight in his shop. One of his mechanics is going to help but when he worked on J's truck he want $50/hour. I'm not sure what he'll want for me...but I know that it will be cheaper then taking it to a garage in the city and I know I can trust the work being done on it. Unforutnatly this $300+ expense is on my Visa. As is the new patio set I just bought. 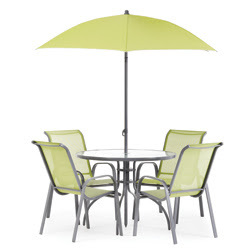 Okay.. so the patio set could have been avoided, I had a serious case of misjudgement but I REALY wanted it. Yes, I had a want and I induldged it. I don't feel good about it, but I really love my patio set. It's very cute. Okay...after this, I will defninatly cut up my credit card. Soon. As soon as all of these transacations are posted on my credit card, I will re-formulate my credit-card pay off plan and post that. I went home for Easter and spent some time walking & talking with my mom. I was feeling very overwhelmed with money and needed to vent. Above and beyond all my other ins and outs in terms of cash flow I'm also the point of money flow for myself and my three other roomates. So I get three rent checks a month and three utilites checks a month. Rent comes on generally in the first week but our landlord doesn't always deposit the rent money on the first and utilies are spread out throughout the month. So I basically have these huge influxes of money coming in and out. And although the utilities come out very regularly (everything is on automatic withdrawls) it's not always the same date - so hard to plan for. I told my mom that I have about $150/week for my variable expenses (groceries, some planned spending categories, restaurants, and personal items). I'm not comfortable carrying that much cash around in my pocket, and with so many roomates I don't want jars of money laying around. On top of that - i've been getting zinged with bank fees (that were not planned for). So after all that - we came up with a plan. I called ING and opened another savings account with them, but one that has a debit card (which I am currently waiting to receive). Every pay period I will automatically 'pay myself first' and $300 goes into that account. This way, I can use this new account for all of my day to day, variable, ins and outs. I will write it down and track it so I know where the $$ is going. This will resolve my almost nerotic (my boyfriend J would say 100% nerotic) behaviour of checing my banking information every day at least twice a day - doing math in my head trying to figure out how much money I have, how much is already allocated somewhere else (like rent or utilties) and how much is mine. So. I have one 'magic jar' (any gail fans will know what i'm taking about) which will be a no-fee savings account with debit card access. I should be able to carve up my credit card and debit card for my primary accounts where I have huge in's and outs. I'm going to give it 4 weeks before I do that - just in case I missed something. This is my new plan. I hope it works. 36 Free (or almost free) Things To Do..
Bake! Don’t know how? – learn! Have a potluck – you have to eat anywas, might as well do it with some friends, perhaps you could have a potluck while meeting your neighbours! A LOT of people are worried about right now, including myself. My company has been slowly downsizing and making business decisiosn where, unfortunatly, appropriate. It is a very hard decision to let people go - and the impact is huge! You will experience most of these feelings. Sometimes all at the same time. It is important to allow yourself time to experience these emotions. To keep yourself safe and make sure that you are not isolated share your feelings with a trusted family member or friend. Release anxiety through adequate rest, nutrition, exercise and relaxation. Take extra special care of yourself. This comes with time and always at your own speed. There is no right or wrong time to reach this place. Once you are here you are truly ready to start planning for the future. Remember, there is no set time frame and no right or wrong way to experience loss. It is an individual process for all of us. Remember, it is important to understand that your reactions are normal so be kind to yourself as you evolve through the changes. The loss of a job can feel like the end of the world. It is a big change but it is also an opportunity to find a new direction and take on new challenges. Six months from now you could be in school, or in a new job learning new things and meeting new people. It is always true that change is the place that we find the most opportunity. We hardly ever find opportunity in the routines of our normal everyday life. Change is hard but it is also good. Go to your local Human Resources Development Canada office. You have a maximum of four weeks from your final day at work to submit your application. Check the website @ www.hrdc-drhc.gc.ca/ae-ei/. I have updated all of my tracking bars as today was payday! I also have updated some of my goals to be more realistic, and my tracking bars reflect this now. Once I acheive these goals, it will be easier to set new, higher ones. Also I now have buttons! Yes, I am quite please with my learning HTML and CSS (also thank you Lindsay for your help!). There is now an 'about me' page and a 'goals' page. I will update and create more as the need arrises. I just had an idea to have a 'budget' button. I will do that this weekend. 1. Know what your worth! Do some research to find out what your worth. Do you have a unique skill set, or a lot of experience? Maybe there are other companies currently hiring for your position. Check out these two websites to help you out. You will likely have to prove your worth to your manager. Have you recently found a way to save the company money? Be prepared to present that to your supervisor. Do you have any thank you cards or emails from peers, or people who have more seniority then you? These can be useful in ‘proving’ your worth to your boss. 3. Ask for a Raise! Something my mom has always told me is that you can’t expect to get something unless you ask for it. So ask, book an appointment with your boss and make sure you practise before asking/presenting your case. Talking about it before hand with a partner or friend can help make sure you ease your jitters before asking the real thing (your boss). 4. Don’t Stop at No! If the answer is no, it’s okay, don’t forget to breath. Let your boss know that you would like to revist the conversation in 6 months or a years time (depending on where you are at) and ask them what they need to see from you to turn that no, into a yes. If you don’t ask – they probably won’t tell you. Move forward with the support that they give you and in while you wait for your next meeting, look for more ways to prove yourself to your boss and to your company. Okay - so about that new car....it was a fleeting fantasy. I am still going to look, but slowly. I would like to know what I want when I can afford it. It looks like Jordan will be able to get my car to stop sputtering with about $300 in parts. A far cry less then a new car payment. I think my new car timeline is going to be more like 6 months from now rather then 6 weeks from now. By October I'll have my Visa paid off (in theory) and have boosted payments on my student loans. Like many 20-something year olds, I am very eager to be in my own place. I know this is 3 or so years away, but I want to be so prepared in that time, armed with knowledge and money so that the process is relatively simple. I recently got some advice about your debt to income ratio, and how this can affect the amount of money you can borrow to mortgage a home. This is the ratio that lenders look at to determine what they will give you. There are two kinds of ratio your Gross Debt Service Ration (GSDR) and your Total Debt Service Ratio (TDSR). If your GSDR equals more than 32%, it is HIGHLY unlikely that you will get your mortgage. I won't say that you won't get it - b/c i'm not a financial advisor, but this is my understanding. Your TSDR, or your Total Debt Service Ratio includes PITCH (or PITH as the case may be) as well as all other forms of debt. Other forms include student loans, credit cards, lines of credit ect. Your TDSR cannot exceed 40% of your income if you are looking to get a mortgage. So PITH + Other Debt/Income = TDSR. This is what I learned, I hope that it is helpful. My current vehicle, a 1997 Mazda Protégé, is going to start needing largely monthly investments to keep running. I bought it used, 6 months ago for $1500, I’m happy with that, and Jordan put a lot of work into it. We figure it’s probably worth about $2000 now. That said, I’m not willing to invest a great sum of money to keep it running. We are also looking at purchasing a home in the next 3-5 years, so actively look for ways to increase our credit rating and our savings. With both of these things in mind, I am thinking about purchasing a ­new, highly economical vehicle. Tonight we looked at the Hyundai Accent (GL 3 Door Manual). We could finance it for 36 months, 0% financing for about $450/month after taxes/levies. It comes with a 5 year, 100,000km warranty. I think it would be pretty fantastic to have the car paid off in three years and have insurance for five years. Once my credit card is paid off, to which I’m putting $500/month (slightly accelerated currently) that could effectively go towards the car. The excess of course would go toward my student loan. I haven’t worked it all out yet, and I would also have to look at likely increased insurance costs – but it’s something that I’m going to consider doing. The salesmen we met was actually also a mortgage broker (conveniently enough), so we chatted to him a bit about credit, and debt ratios, and mortgages....that will come in another post. To eliminate the remainder of my credit card this is my plan - which I have broken down by my next three pay periods. I have created automatic withdrawls from my chequing account on to my Visa for the following amounts. Cross your fingers for me, I really hope nothing comes up before this is paid off an my emerg fund is solid. I think i like them better - i've done my savings bars so far, but havn't changed the debt ones. What do you think, which looks better? cable and electricity, is not recorded in your credit report, some cellphone companies may report late payments to the credit15 Financial Consumer Agency of Canada reporting agencies, which could affect your score. Try to pay your bills in full by the due date. If you aren't able to do this, pay at least the minimum amount shown on your monthly statement. below the limit. The higher your balance, the more impact it has on your credit score. score. However, your score does not change when you ask for information about your own credit report. Make sure you have a credit history. You may have a low score because you do not have a record of owing money and paying it back. .... and I think sucess breeds happy, and happy breeds more success.. so this is a good road to be on. I've just updated my side bar numbers again... I've cleard if almost 64% of my Visa debt!! Thank you taxes!! I'm going to be a hermit this month (try to anyways) and try to get the last $1162 paid off within a month... I think i can *just* barely do it... it might be 6 weeks though instead of four. It will feel so so so so good. Once that's paid off, i'll focus on my Canada student loan which has the largest interest rate (after my visa) at 5%.. the alberta student loan has an interest rate of 2.5%. Currently I put about $60/month on both of them. I think I will put $200, on the Canada loan and $100 on the Alberta loan (again once the visa is paid off). at $300/month they should be paid off in about 2.5 years. Granted - It would be great to pay them off sooner but that will be the game plan for now. If I come into any 'surprise' money, it will go towards this. Does anyone have other suggestions for paying it off quick? I could get another job, but with my hours it would be challenging. What have people done to make money working from home? ?